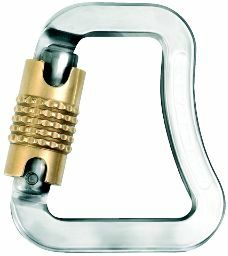 These stainless steel carabiners are specially designed for paragliding and powered paragliding. The flat upper and lower inside surface means that no undue stress will be placed on the hang strap or risers. The gate automatically locks in the closed position with a quick spring action. To open the gate on the stainless carabiner, simply twist and push in on the gate! Guaranteed load 26kN, extremly high tensile strength, qualified for tandem flying, each single piece is tested with 1700kg.